Dreams are free, but are also priceless. I've just downloaded this PDF and I think it's going to be really useful to me in my games. 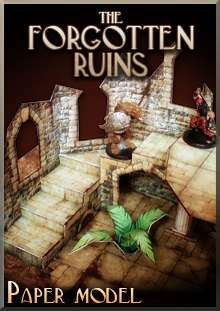 On two levels with an undercroft supported by pillars it's a very appealing model that can fit all manner of scenarios. Once I've built it I'll no doubt have more to say, but perhaps my only criticism is that the broken walls don't follow the stonework courses and look a little odd with straight line breaks. I'm planning on re-cutting these breaks in a more organic way when I assemble the model, but really I feel that this is a minor point as everything else about the model sheets looks excellent. Just roll the darn dice. Pixel pusher and proud of it.